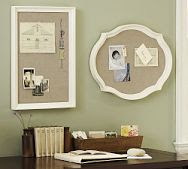 Many moons ago I saw these pretty bulletin boards in a PB catalog. I. fell. in. love. I have had them on my project list ever since. This weekend, I finally got around to making me some. First, I stopped at my favorite thrift/junque/antique shop and found a couple of old frames. (I got both for only $5!) Then, after I started painting the first one, I remembered to take a before photo. I gave each frame a coat of Nantucket White by Ralph Lauren. Just one coat, because I wasn't interested in creating pristine looking frames. I wanted them to look a little shabby. To add to the shabby-ness, I took a sanding block and knocked a little paint off the tops of the relief. Then to make the pin-boards, I just wrapped some pretty linen around some cardboard and hot glued it on the back. I would really recommend getting some foam core for a project like this, but I was aiming to use what I had. Popped them in their respective frames and VOILA! You'll have to check back later this week to see how I use these little lovelies!! Very sweet- looking forward to seeing how you will use these pretty frames! So easy, and so pretty! What a lovely craft idea. Thanks for sharing. Very cute! I've had these on my list too. Glad you got to yours - they turned out great! DONE. This is happening in my house TOMORROW. Love it! GREAT idea! Great example of "Why not use what you have?" No need to buy unnecessary supplies. Beautiful work, Wendy! They would work equally well in shabby chic, romantic cottage or country decor. Those turned out great and much less expensive than PB!!! I did something almost exactly like this using an old frame and foam board. I use it in my cra(p)ft room. Can't wait to see what how you use them! Lovely! I love the linen and white combo, such a great classic look!! THis just went to the tp of my list in must do! love, need, must make!!!! They look awesome! Can't wait to see where you place them. What cool inspiration to just make it yourself on the frugal side! Very pretty! I love those! I L.O.V.E. them!!!! I am always a succer for a cute pin board, or magnet board!! What a fun, simple project! Way to go! And thanks for sharing it with us. LOVE the way these turned out! I was loving those in the catalog! Nice job. What size are the frames? I'm looking forward to the follow-up post. We have similar taste....or at least a flair for PB knockoffs! What a great project and I love that you used what you had!They look terrific! I need to add this brag board because my children want me to display all of their school work and the fridge is just too small! SO so pretty. I love that project!!! Very pretty. I love how a coat of white paint really transforms an item. These are fantastic! I was immediately inspired to give this a shot! Very pretty--I am your newest follower. I have a party--every Monday--Its So Very Creative and would love to have you post this.